First a phone call saying that a big parcel is on its way. Then a ping on the door a couple of days after. I am rarely so scared and excited as when I open packages with samples in it. Sometimes you get happy and exhilarated, sometimes you get less happy and more sad. Or sometimes you don’t know what to feel. You might just have to sip the picture for a while. Walk around with it, rest your legs on it and then look again. I’m looking at this fellow now. His name is Otis. Otis the rug. Otis is a hand hand-woven wool rug made for Rym (remember Anna’s and mine adventure), which will appear on the web soon. Mmmm. He looks like he’d make a wonderful new friend! He must be of the same species as Josef Frank’s Matta nr 7! I love Otis! Must have! Thank you for making! Awesome! A tiger or a bear? Sannamanna, Sined and Ben. Otis is definitely inspired by both J Frank and the Tibetan tiger rugs. Don’t know what species he is though. He might be a tiger or a bear. He has kind of elephant feets though. He must be a one-of-a-kind species..
Frida, det är ett bra projekt verkligen. Mycket jobb, mycket kul! I’m glad to hear positive comment about Otis, thank you! Otis looks very friendly, warm, and welcoming! Congratulations on your first rug! I love Otis, when where can I find him! Fin! Gott nytt år Elisabeth, och all lycka till dig! Oh , it’s wonderful and beautiful ! Congrats !! Åh, men sååå alldeles underbart fantastiskt fin…och man ser att Otis är din. It’s amazing! I would be very happy to have this in my home! Det ser väldigt fint ut, men jag förstår den svindlande känslan. Rym verkar spännande, lycka till! I like this Otis the rug animal a lot. I like the sturdy feet and the expression on his face. And does he have the nicest colouring! Yes yes!! oh it looks amazing! I love your work so so so much… you are unbelievable! hugs and kisses to you! Helen, you will be able to find the rug over at the Rym site some time in the middle of January, if things goes as we hope. It will also be available at Rym’s retailers further on. Bmo, kul att höra att han ser ut att härstamma härifrån. Det är bra, tror jag. isoinpapu, big size sturdy feets indeed. The coloring is a chapter for its self. Would be interesting to see him in several color sets of course, but it’s good with limits. Uli, true true. It’s a good thing to look with fresh eyes to overlook mistakes. Again, nice to hear your comments! Dear Elisabeth, I love this guy Otis! Can’t wait to see him in full size and in an interior context. The colouring is fabolous and so is his elephant feets. Happy New Year from Finland! Neat that you have your own designed rug! And I totally dig the name and design. Congrats. I rellay like the warm and playful feeling of it. Feels unique and new. I like your Rym-logo as well! Your work? V. yes isn’t it nice the logo! It is not made by me, it’s our eminent graphic designer Fia Miari who has made it. I keep telling her to put up her own page on the web. I’ll nag a bit more. She has great work to show! Å, hej otis, så fin du är! Hello Otis, I’m looking forward to your fellows! Jättefin matta!!! Passar på att önska er ett riktigt Gott Nytt År! our livingroom rug is falling apart… i have wanted to have a tiger rug since forever, there’s a big book only about them, have you seen it? this one would be perfect for us too! 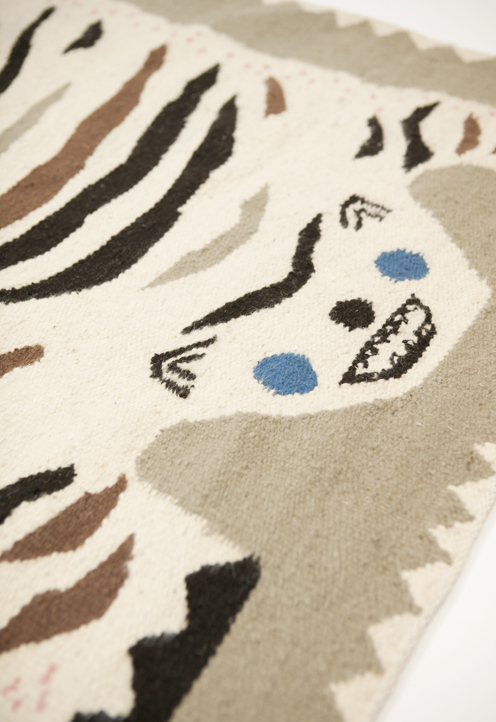 Fantastic this rug – looking so much forward to see much more of Otis! Hanna, no I haven’t seen it. Sounds interesting! Do you remember the name of it? Detsamma detsamma Maria, och tack! vad fin den ser ut! Beautiful elisabeth, I look forward to seeing the rest of the collection. Happy 2012! OTIS. Ett favvonamn. Bra val. Passar så himla bra. På en sån fin grej. APPLÅDER I STORA LÅDER! Malin, någon tusenlapp antagligen. Har förhoppningsvis besked i början på februari. Vem skulle inte vilja trampa på honom..? Oh where can I get this AMAZING rug!!? 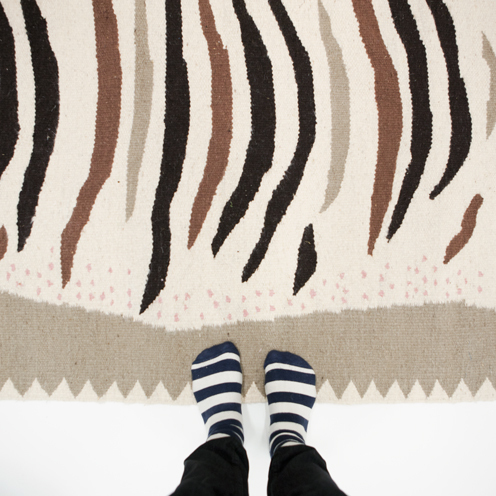 Otis is inspired by both J Frank and the Tibetan tiger rugs.